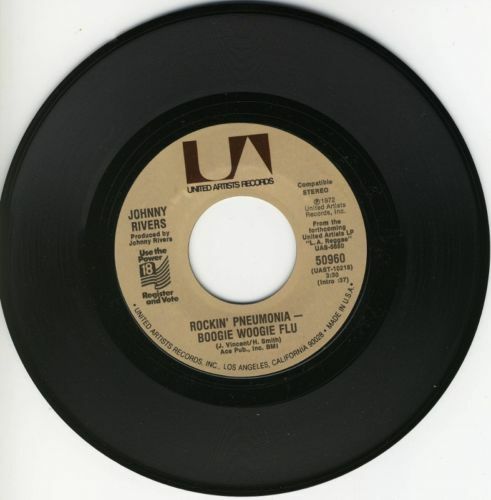 Johnny Rivers issued some of the catchiest and best singles of the 1960s and 1970s. He had 29 singles reach the BILLBOARD Hot 100, 1964-1977. “Seventh Son” was written by blues great Willie Dixon and first recorded by Willie Mabon in 1965 for the Chess label. Rivers version is pure up-tempo pop and was perfect for AM radio. Released during the summer of 1965, it reached number seven during its 11 weeks on the chart. It remains one of his definitive performances. 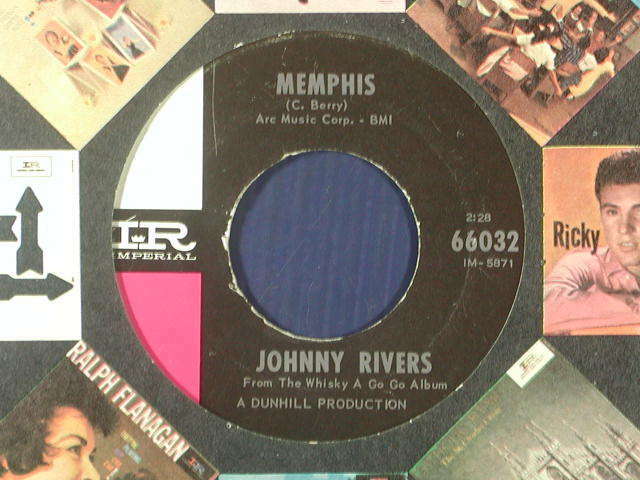 Johny Rivers was a consistent hit maker during the mid-1960s to mid-1970s when 29 of his releases made the BILLBOARD MAGAZINE Pop Singles Chart. His first hit came during 1964 but amazingly he had recorded for 12 different labels, 1958-1964. His big break came during the late spring of 1964 when he issued a cover of Chuck Berry’s classic tune, “Memphis,” which he recorded live at THE WHISKEY A-GO-GO. It may not have been the equal of the original but it was very good in its own right. It was smmoth but not as gritty. Berry’s original was actually a B side in the United States. He released “Memphis” during the spring of 1964 and it almost made it to the top. It spent two weeks in the number two position on the BILLBOARD MAGAZINE Pop Singles Chart. The best was yet to come as he would become a prolific songwriter and even own his own label in addition to issuing his own hits. He is still performing nearly 50 years after his first big hit. Johnny Rivers catalogue of singles during the mid-1960s through the mid-1970s was the equal to just about any American solo artist. Led by the number one hit, “Poor Side Of Twon,” they sold tens of millions of copies. He had a commercial down turn in the late 1960s. While the quality of his material remained high, they did not chart as high as his classic work during, 1964-1967. 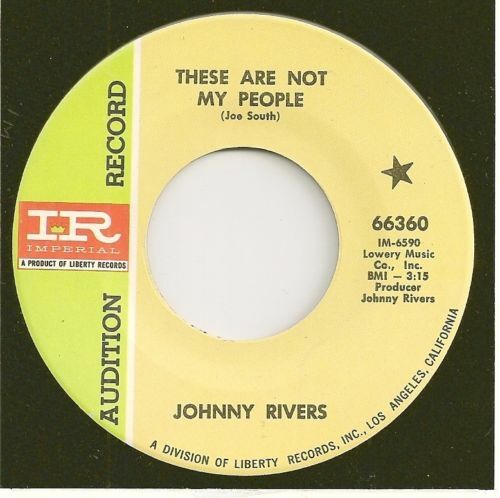 “These Are Not My People” was a Joe South composition and Rivers gave it a gritty and sparse performance. Released during early 1969, it peaked at number 55. He would have a commercial comeback during the 1970s and has continued to tour and record down to the present day. I recently listened to a Greatest Hits album by Johnn Rivers and the high quality hits just flowed out of the speakers one after another. 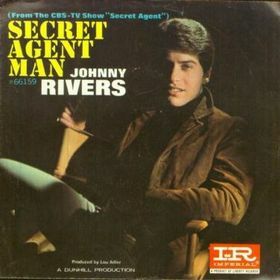 “Secret Agent Man” was the title song of the television series of the same name. Released during early 1966, it peaked at number three on the BILLBOARD MAGAZINE Pop Singles Chart. It remains one of the better single releases of his career, which is saying alot. The uncredited guitar solo and the drums which provided the foundation for his vocal remain a good listen over 45 years after its original release. Just about any single issued by Johnny Rivers on the Imperial label is worth a listen and when you gather them all together onto a compilation album, the results are spectacular. 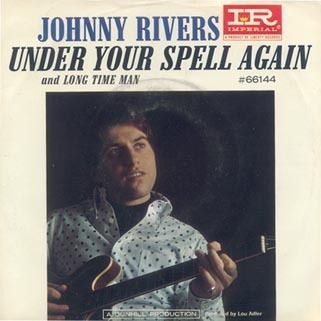 “Under Your Spell Again” is one of his lesser known singles.” It was written by Buck Owens and has charted a number of times on the country charts but Rivers took it in a pop direction. It was not among his biggest hits as it only reached number 35 on the BILLBOARD MAGAZINE Pop Singles Chart. Despite it being a somewhat forgotten song in the Johnny Rivers catalogue, it remains another fine listen. 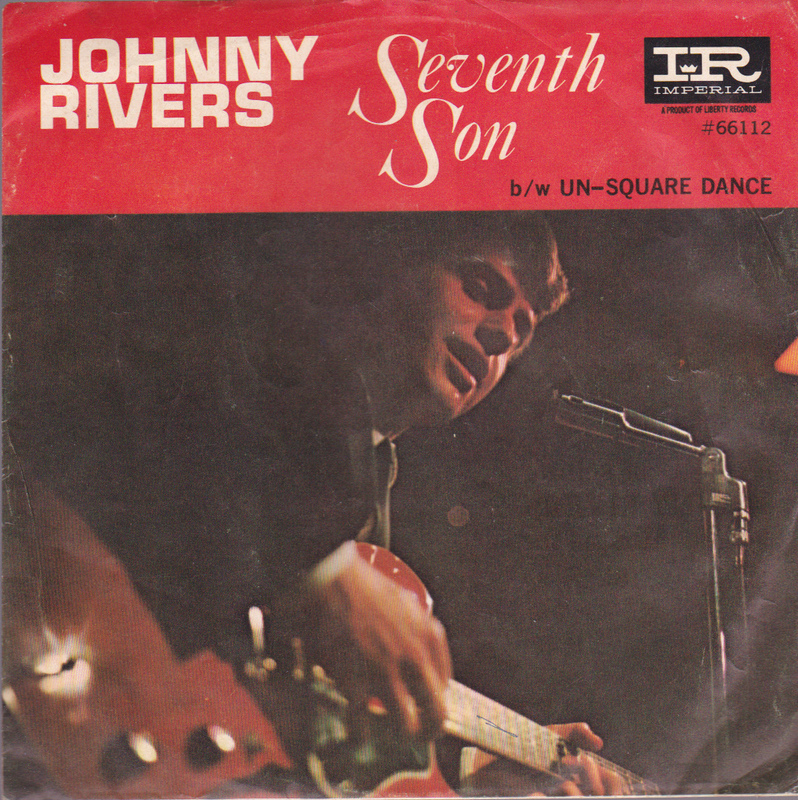 Johnny Rivers cranked out 19 chart hits between 1964 and the end of the decade, including seven that reachd the top ten. 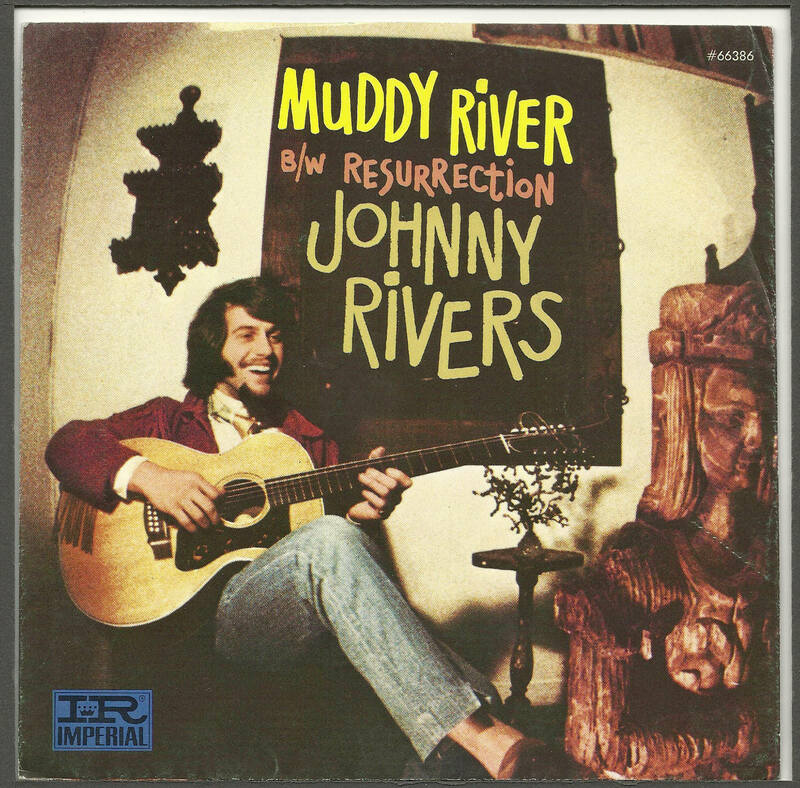 “Muddy River” was released during June of 1969 and ultimately reached number 41 on he BILLBOARD MAGAZINE Pop Singles Chart. It was typical of the smooth, uptempo pop that would always be a part of his career. The problem was that musical tastes were changing and while he would continue to have some hits during the 1970s, the most popular part of his career was coming to an end. Rivers is still on the road and his catalogue of music is one of the most underrated in 1960s pop history. Johnny Rivers had the knack of taking other people’s songs and turning them into his own unique creations. “Rockin’ Pneumonia And Boogie Woogie Flu” was originally released during 1957 by Huey “Piano” Smith and his backing group, The Clowns. It was a huge Rhythm & Blues hit selling over one million copies. Smith was (currently retired at age 77) a New Orleans boogie style pianist. Rivers transferred the song to a rock ‘n’ roll sound and it remains one of the more rocking performances of his career. Released October 7, 1972, it reached number six on the BILLBOARD MAGAZINE Pop Singles Chart. It proved that a good song always remains a good song when performed by a good artist. You are currently browsing the archives for the Johnny Rivers Reviews category.